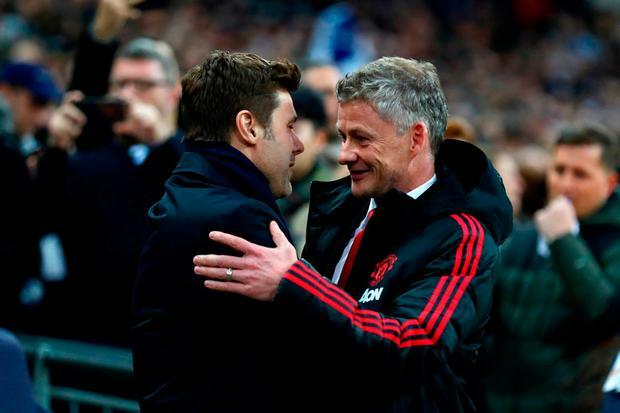 Ole Gunnar Solskjaer emphasised that Manchester United are all "about winning trophies" after Mauricio Pochettino attempted to downplay the importance of silverware at Tottenham. The Old Trafford hierarchy are currently looking for a permanent successor to Jose Mourinho, having last month grown tired of antics off the field and lack of progress on it. Solskjaer is the current bookmakers' favourite after embarking on an eight-match winning run in all competitions - a club record that has helped him usurp Spurs boss Pochettino in the odds. Admired within the corridors of power at Old Trafford, the Argentinian's impact on teams has rightly attracted fans - but the conspicuous lack of silverware during his managerial career remains an issue. Spurs' hopes of Carabao Cup and FA Cup glory have gone up in smoke in recent days, with Pochettino raising eyebrows by saying that consistent top-four finishes are more important than trophies. Put to Solskjaer, he said: "I am not here to discuss what Pochettino says and what other managers say. "First of all, it's the next game but we are about winning trophies - of course we are - and we can't win the league this year. "We are still in the cup, we are going to try to win the FA Cup, of course. "I think every manager wants to win every game, so I don't think that is the point he was making." Asked whether he would choose between the top four and trophies, the Norwegian said: "If you win trophies, that's a fantastic day for everyone in the club. "It's just the best time of your life is that day when you win because you never know when the next one is going to come. "The manager (Sir Alex Ferguson) always said enjoy this, whatever trophy you win, you have just got to enjoy it. "But, then again, it's not up to me to discuss whatever anyone else says, I am just saying that we here at this club, we are looking to win trophies." Solskjaer understands as well as anyone what makes United tick - a club synonymous with success and driven by silverware. The 1999 treble hero is back in the north west until the summer, when the Norwegian is due to return to his job at Molde - but he spoke about next season ahead of Tuesday's match against Burnley. United's caretaker manager sees this period as important to reorganising and launching a better title challenge in 2019-20, with top four the short-term aim rather than a yardstick with which to measure success. "That's not the dream, though, to be top four," Solskjaer said. "For Man United, you should always aim to win the league. "We can't do that this year, but we've just got to look forward to that again because we have to get back to that. "We've got the Champions League, we've got the FA Cup. We can't just say top four and that's it. "We've got to look at 'can we win something this year?' And, as I've said, I go into every single game as a Man United manager thinking we can win this game." Solskjaer is helping to foster that mentality within a group that had been faltering under Mourinho. Improvements in the likes of Paul Pogba and Marcus Rashford have been striking, but there remains more to get out of the likes of big-money summer signing Fred. "I don't think it's my challenge to incorporate players," Solskjaer said. "It's about the players being ready when they get the chance and Fred's been working really hard in training. "He's a good lad, same with Andreas (Pereira), he's working really hard, you've got Scott (McTominay) and when they get the chance, because they will, we want to see improvement. "We know there's a very, very good player there with Fred, so hopefully he'll adjust to the English game because there's no doubt there's talent. Absolutely no doubt."